Life is not exactly a bed of roses for most innovation leaders and intrapreneurs—those assertive, innovative, corporate risk-takers who passionately turn ideas into profitable products. They take on corporate sacred cows and face down challenges that would cause less driven and less talented people to quickly throw their hands down in defeat. They struggle daily to unleash entrepreneurial thinking while dealing with an army of people fiercely dedicated to maintaining the status quo. The question for business leaders is simple: How can innovation leaders and intrapreneurs freely operate in a corporation that wants to keep things the way they are? The answer is also simple…Read The Open Innovation Revolution. This practical guide reveals that, without the right people to drive innovation processes, your odds of success shrink dramatically. And as open innovation becomes the norm, developing the right people skills—networking, communicating with stakeholders, building your personal brand and the ability to sell ideas—is essential for your innovation leaders and intrapreneurs. 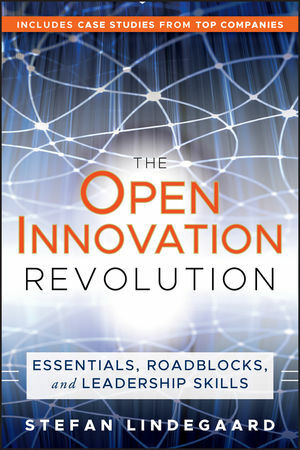 Written by innovation thought leader Stefan Lindegaard, The Open Innovation Revolution helps you know if open innovation is right for your organization, and then shows you how to prepare those within your organization to make the leap into the challenging, new world of open innovation. STEFAN LINDEGAARD is a speaker, network facilitator, and strategic advisor who helps companies on the topics of open innovation, intrapreneurship, and how to identify and develop the people who drive innovation. He has served as a strategic advisor and facilitator for innovation leaders and intrapreneurs from global companies such as Bang & Olufsen, Danfoss, Grundfos, Lego, Novo Nordisk, and Novozymes. With open innovation, he delivers talks and sessions that help companies understand this new innovation discipline. With intrapreneurship, he helps companies design programs that identify and develop intrapreneurs as well as new ideas. His work in this field includes a pioneering business plan competition at the industrial giant, Danfoss. The program succeeded so well that it inspired other world-class companies, such as Hewlett-Packard and Novozymes, to undertake similar programs. Chapter 1 Why Open Innovation Matters. Chapter 2 What Open Innovation Looks Like. Benefits, Challenges, and Stumbling Blocks. The Essential Element of Trust. Chapter 3 How to Approach Open Innovation. Elements of an Open Innovation Culture. Chapter 4 First Things First. What Is Your Mandate for Open Innovation? The Innovation Strategy and Strategic Purposes. Be Innovative Rather than Strive to Become Innovative. Chapter 5 How to Identify and Develop the People Who Drive Open Innovation. Two Kinds of People Needed. Traits to Look for in Innovation Leaders and Intrapreneurs. Chapter 6 The Networked Innovation Culture. Why a Networking Culture Is Important. What a Networking Culture Looks Like. Chapter 7 Why Top Executives Do Not Get Innovation, Much Less Open Innovation—and What to Do About It. How to Operate in This Environment. Chapter 8 Defeating the Corporate Antibodies. Chapter 9 Radical Innovation as a Roadblock. PART III Personal Leadership for Open Innovation. Chapter 11 Know Your Values. Chapter 12 Making Change Happen. Five Steps to a Change Strategy. Putting Time Management into Action. Chapter 14 Polishing Your Personal Brand. Chapter 15 Strengthening Your Network. Use of the Network: Influence and Action. Networking in the Real World. Chapter 16 Sell Your Vision and Ideas! Chapter 17 Corporate Business Plan Competitions. Create a Vehicle for Open Innovation. Chapter 18 The Review: Everything in One Easy Place. Appendix A The Ten Types of Innovation. Appendix B Open Innovation Examples and Resources.